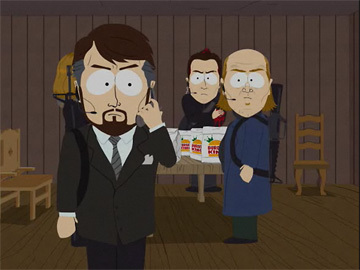 my friend armin mentioned yesterday that the german terrorists in the latest south park episode, “super fun time”, reminded him a lot of the ones from the 1988 movie “die hard”. 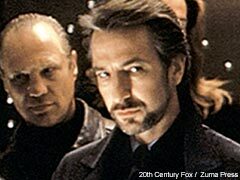 in “die hard”, the name of the villains’ leader is hans gruber (played by alan rickman) – in this southpark episode, his name is franz. i guess that’s about as close as they could get without risking a lawsuit? by the way: in the german version of “die hard” (titled “stirb langsam”), the names of the terrorists had to be changed into english ones – hans, karl, heinrich, were changed to jack, charlie and henry. update: note how the woman’s face is obscured by hans gruber in both images.